In this fourth exploration of the use of decoration in illustration, Kim Geyer shows how using pattern can be character building. 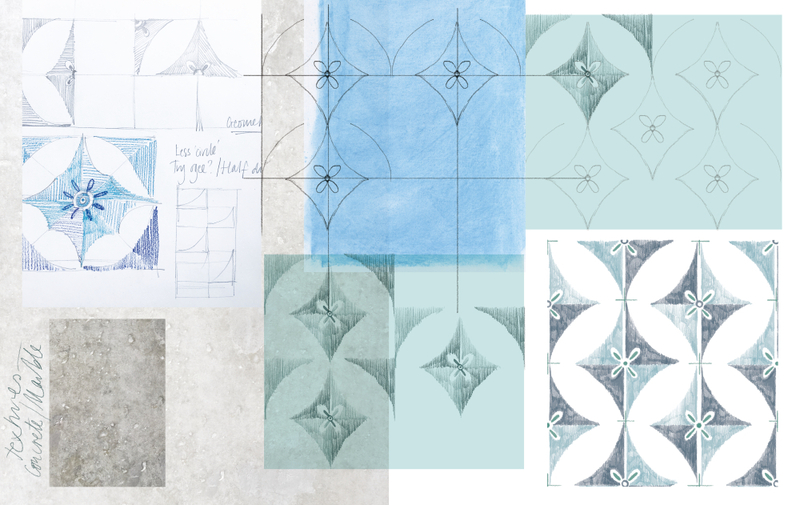 Before I took up my illustration pencil, I was a textile designer making furnishing fabrics. The designs were huge repeated patterns painted to look like they were printed; very flat, in gouache, but full of depth and texture. Zip forward a few years and I find myself still using pattern, and texture in my illustrations. Today I work on paper (inks, and coloured pencils) and digitally which gives a wonderful synergy to the creative process. I tend to create people, and rooms, and more recently landscapes within which are patterns, be they ornamental or in swathes of shapes, cutting out the form of a mountain, or describing the fabric of a building. I tend to ‘see’ in shapes and patterns, and not necessarily patterns in the decorative sense. Referencing textures from my library of textures made up of photographs, and scans of textures made in ink, acrylic, pencil, and pastel. When I’m working on character design, for instance, I think about what they are wearing, and why? And I think about space, and function of a setting. What would a poor five-year-old boy wear to a party at a palace? What can I use to best depict his character, in this space? If I’m drawing a turbulent sea, could using pattern enhance the feeling of motion, and depth, or of danger, for example? And if I use pattern, it is for a very good reason – to help tell the story. 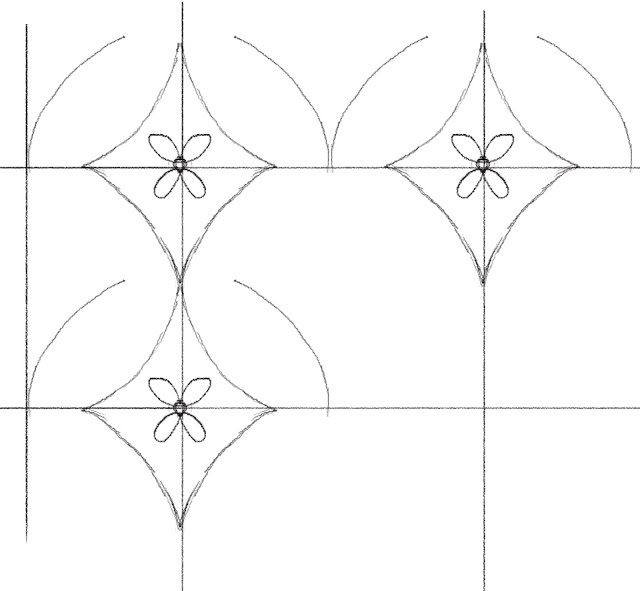 Working out a repeat pattern. 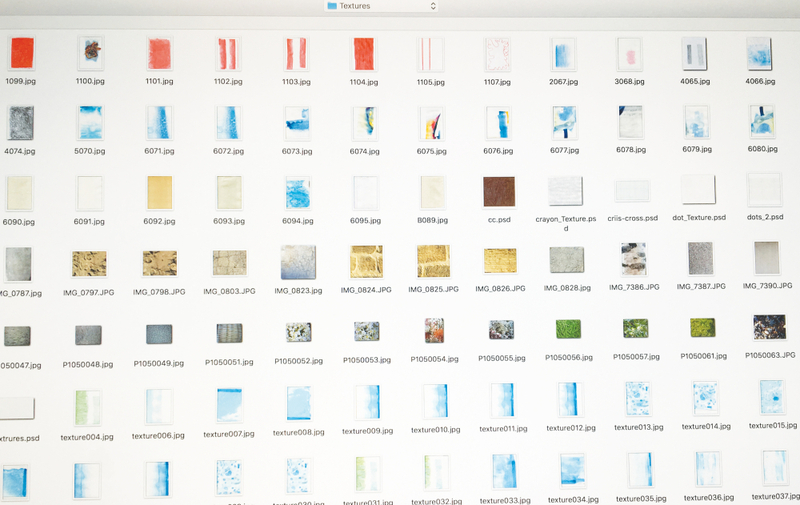 Storyboarding pattern, shapes, colours, and textures, scanned in and worked up digitally. I don’t want to use pattern for the sake of filling a space either. Flat or open space works perfectly well, but sometimes texture and pattern really can give an insight into character. For instance, in the picture below the hand-drawn floral pattern on the yawning lady’s dress, (picture book work in progress) with a '70’s print feel, hopefully depicts her character – friendly, ‘chocolaty’, warm, ‘mumsy’. The palace wallpaper needed to be grand but slightly edgy, and was conceived on paper and then worked on digitally. I wanted a slightly muted and minimal palette so used geometric shapes, and chalk pastel textures to soften. The snooty princess, however, is bereft of any pattern here because, on the practical side, if I have to draw her many times, (she could be the star of the show) then keeping her clothing simple makes that task a lot easier, but on the character side, she has yet to be revealed. Using pattern and textures in final piece. Figures and assets drawn and scanned in, and pattern/texture applied digitally. If you’d like to work with pattern and texture, you could start by painting or inking up some textures, or cut-out pattern from magazines, (or better still try having a go at drawing your own) and collaging them on to a drawing. Take photographs for textural references, create a library of those that you like, and look for pattern when you are out and about – it is everywhere! 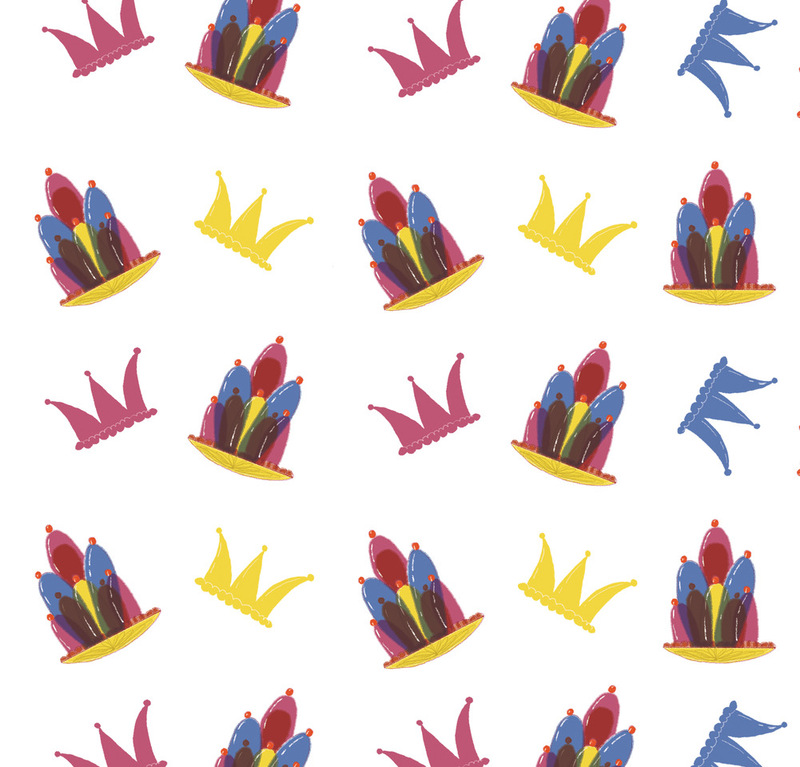 If you would like to make digitally repeated patterns, you might find this tutorial useful. 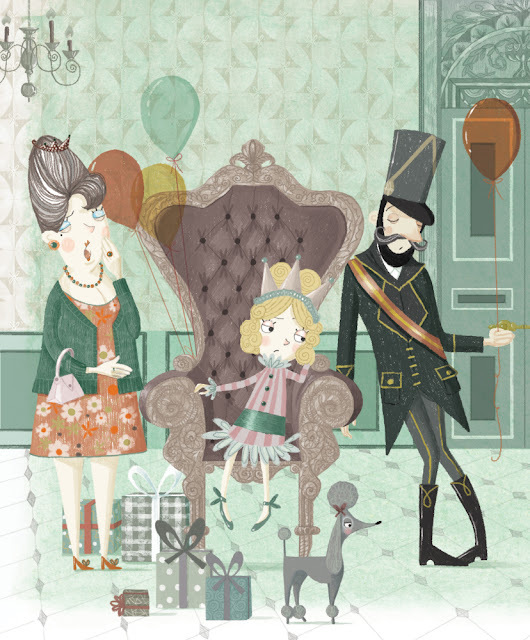 Kim Geyer is a widely published picture book creator and illustrator based in London. www.kimgeyer.com. She's represented by Claire Cartey at the Holroyde Cartey Agency.